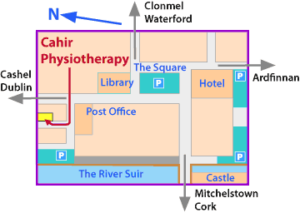 If you need a physiotherapist in Tipperary, look no further- Cahir Physiotherapy Clinic is one of Tipperary’s leading physiotherapy and sports injuries clinics. We are highly skilled and experienced Chartered Physiotherapists. We are passionate about getting you better. Appointments are available Monday- Friday until 9pm. Pilates classes, designed and led by Chartered Physiotherapists, are held in the clinic to complement your rehabilitation. You do not need a doctor’s referral to attend for physiotherapy. Yes, we are Chartered Physiotherapists and our fees are covered by all the main health insurance companies. How to find us- easily! For anyone who needs a physiotherapist in Tipperary, North Cork, East Limerick and West Waterford, Cahir is just off the M8 motorway so easily accessible. It’s only a short drive from Clonmel. Please see the map below. We are just off the square in the Craft Granary building. Parking is free and plentiful.